This album project just kind of happened. The Polley family grew up in Greenhills and we lived on Inman Ln. We moved there in 1962, and my sister Bunny graduated there in 1965. Terry graduated in 1969, I graduated in 1975, and my brother Dennis graduated in 1977. My brothers and I all played instruments in the band with Mr. Wimmer, and my sister sang in the Concert Choir. Our mother, Violet died in 2002, and our father, Parker passed away in 2007. When it was time to sell the house and move everything, my family gave me my Mother’s record collection, along with several albums my sister said I could have. That is when I found the LP recorded in 1969, only to find it had been played a lot and had a lot of scratches on it. When I told my brother Terry, who performed on the album about it, he had told me that he had the same album, but had never really played it all that much. He pulled it out of his collection, and when I played the recording, it was in mint condition, and I just felt that this was something a lot of folks who went to Greenhills High School would want with all of the reunions going on, mine included. Terry and I agreed to put this project together so everyone else who performed on the record would want a copy of it, especially in the condition it is in. I have re-engineered the LP and transferred it to Compact Disk for all to enjoy all over again some 47 years later. It sounds great, and it is so good to hear it again after all these years. The print of the man on the front cover was Steve Hoskins class of 1969 who was the Drum Major for the marching band. Debby Dobson, class of 1969, designed the front cover. Still do not know what happened to Steve. I have not been able to contact him…. My Brother Terry is in the back ground on the back of the album on the far left side playing the Cornet. Something else about the album that I think we take for granted today is the fact that the LP was recorded in Stereo. In 1969 Stereo was still pretty new to most folks. Though stereo recordings have been around since about 1958, the consumer did not start catching on to the new technology until the early 70’s. I think a lot of folks will be surprised when they hear this recording today. Most folks that had Stereo equipment in their homes were usually one-piece furniture cabinets, and that meant that the separation was not very good to truly listen to anything in Stereo back then. When folks started buying components you could separate the speakers further and really enjoy the “Stereo” experience, but again you are talking about the mid 70’s for the newer stuff. I am sure most that played this record in the day listened to it on High Fidelity mono systems, and it could be that many will hear this for the first time in stereo when they play it. The original LP was put together as a fund raiser so the band, orchestra, and ensemble could get new uniforms that were needed to keep up with the times…. 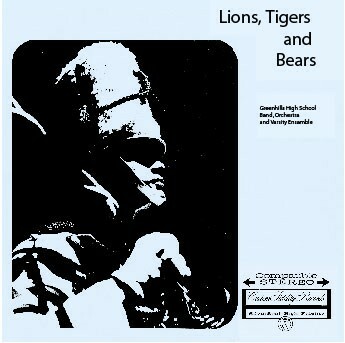 Many of us, me included were the benefactors of the new uniforms and we wore them proudly when we were marching in the band in the early 70’s… We just loved Mr. Wimmer who we all called “The Bear” A brilliant music man who demanded perfection and mutual respect from all of his students…. In the Fall of 2011, word in the Greenhills Community had caught wind of the resurrected LP and there was a special presentation about the LP and how it had come about and ended up at the Community Building during a City Council meeting under Mayor Fred Murrell… The council meeting was aired on Warner Access about the discovery of the LP and how it had come about and was graciously discussed by the Mayor….By the time the council had met, a good friend of mine wanted to air a cut of the resurrected LP and put it on the air of his Radio Program “Voices In Motion” on WMKV Radio…The Mayor was kind enough to discuss that fact it was going to be on the Radio that same evening….That following Saturday morning, the song “Kites Are Fun” was played on the radio program and Warren Anthony gave a very nice description of Greenhills and the Music Program….. It was then I decided to update the original CD that was white and had a stamped imprint of the description and actually had a new label produced to put on the disk along with correcting a few slight spelling errors…I also decided that the Council Meeting and the Radio Broadcast would be a very nice addition to the Album that folks could also enjoy…. In the Spring of 2013 I updated the entire Album with all of the new Artwork and labels and added the broadcasts of the council meeting and WMKV on Track Six of the new “Special Edition” of the CD…I also enhanced everything on the new LP to really bring out all of the instruments and voices on the Album…. It just sounds awesome and it is so hard to believe that these are High School Students who too me all sound like adults today…. It brings me and my family such great joy that we can give something like this to those of us who grew up in the Greenhills community for all to enjoy… The plan is to keep providing the album as long as people keep asking for it…It has truly been a Labor of love…. To hear a sample, click play on the music player below.